After spending some time in Australia with his Belltree trilogy, Australian crime author Barry Maitland returns to England to pick up on his long running Brock and Kolla series. That series, which started in back in 1994 with The Marx Sisters in which Brock was Detective Chief Inspector and Cathy Kolla was a new Detective Sergeant. The second book in the series The Malcontenta won the inaugural Ned Kelly Award in 1995. Twenty four years and twelve books later finds Brock retired and Kolla herself a Detective Chief Inspector. The Promised Land opens with the discovery of a long lost manuscript by George Orwell. Before long John Pettigrew, the publisher who had been offered the manuscript is the prime suspect in a series of gruesome murders, two on Hampstead Heath and one in his own house. DCI Kolla’s team, already investigating the first two murders, wrap the case up and arrest Pettigrew. Pettigrew’s defence lawyer approaches Brock, believing her client to be innocent she engages him to investigate and soon the case looks a little less open and shut. But this puts him at odds with his old partner. 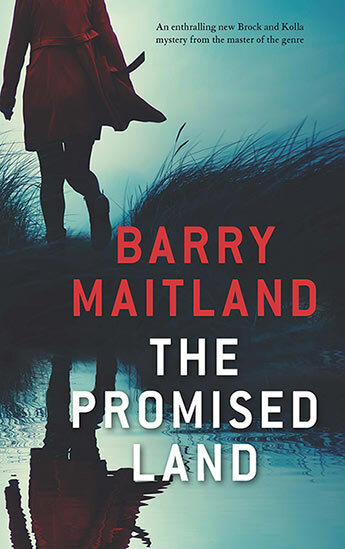 The Promised Land is another cracking mystery from Maitland with two great characters at its heart. Like a number of the earlier books in this series there is a thread of expertise at play, in this case the assessment of potentially lost manuscripts by famous authors. The ultimate plot is so contrived that it does not bear too much thinking about but it is designed to keep readers guessing and the characters jumping through hoops and it does this admirably. While there are plenty of references to earlier cases (even the Marx sisters get a mention), and a little character development, this can still easily be read as a stand alone mystery. It is a credit to Maitland that after this many books he still manages to make his main characters jump off the page. And while the ultimate conclusion is a little hard to swallow, The Promised Land is another page-turning entry in a great long running series.